So, green tea. When choosing your green tea, I highly recommend getting yourself a high quality blend that will offer up a nice earthy flavor. Arbor Teas is always my go-to. Arbor Teas Organic Bancha Green Tea. One of the reasons I chose this Bancha (pronounced BAHN-cha) for my Green Tea Ramen Bowl is the refreshing flavor, which is savory and slightly vegetal. Another reason was to keep things seasonal. Bancha is a style of traditional organic Japanese green tea made from large, more matured leaves and stems from autumnal and winter harvests—which to me sounded perfect for a soothing soup. One important thing to note with this tea is if you’re looking for a stronger flavor, simply use more tea leaves—never steep the tea longer than 2-3 minutes, as directed on the packaging. Steeping the tea for a longer period of time will extract unwanted bitterness—and no one wants a bitter Ramen bowl. The idea was inspired by this belly-warming Ochazuke. I had so much fun creating and testing that recipe! Before it, I would’ve never thought to use green tea as a straight up broth. So why stop there? Trying it with a hearty, crave-worthy Ramen bowl just made sense. I’ve written out my recipe to incorporate these elements, but feel free to add your own personal touches and report back with your results. Inspired by Ochazuke, this soothing Green Tea Ramen Bowl uses Bancha green tea as a broth. It's delicious, and extremely easy to make at home. Prepare 2 cups of green tea as per the directions on the package and set aside. *Don't forget that if you over-steep your tea leaves, you'll end up with an unwanted bitter flavor which will make for a lousy Ramen bowl. Prepare your tea with care and only steep it for the amount of time suggested on the package. Prepare the Ramen noodles as per the directions on the package. When done, drain the noodles, run them under cool water, and place them in a large soup bowl. Set aside. Heat 1 tsp of oil in a medium-sized saucepan over medium-low heat. Add the sliced garlic and grated ginger, and sauté until the garlic is aromatic and tender—about 2 minutes. Stir to keep the garlic from burning. Add the shredded carrots and mushrooms. If you need a second tsp of oil to sauté, go for it. Sauté the ingredients for another 2-3 minutes, or until the mushrooms have started to turn golden in color. Finally, add the green tea, rice vinegar, and soy sauce to the saucepan. Stir, bring to a low simmer—just enough to warm the tea up—and remove from the heat. With a large ladle, spoon the broth and veggies over the cooked Ramen noodles. Add your desired garnishes, and enjoy! To get the perfect soft-boiled egg, place an egg in a small saucepan with just enough water to cover the egg. Bring the water to a boil and let the egg boil for 4-5 minutes. When done, remove from the heat and immerse the egg in cold water to stop the cooking process. When the egg is cool enough to handle, peel it, slice it, and place it on top of your Ramen bowl. This may be the prettiest bowl of ramen I have ever seen - The broth is absolutely delicious, nothing better to enjoy with this fall weather. OMG....everything about this has my name on it. 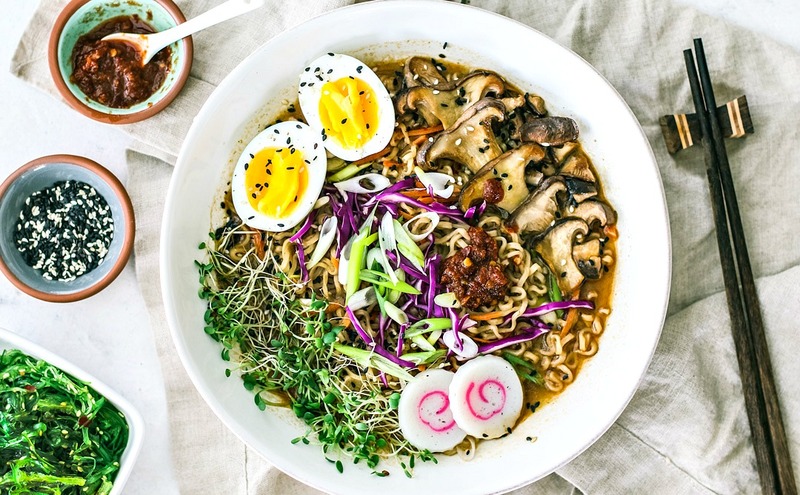 Love a healthy ramen bowl. Green tea is totally my jam. and I love how easily customizable this is. Genius. Why didn't I think of this sooner? Girl, I first saw this recipe pop up in one of my social media feeds and I immediately stopped because the picture is just SO gorgeous! (That soft boiled egg. I need it on my plate now.) I can never get enough ramen, and I love that you've made them with green tea and mushrooms. It's gotten so cold so fast here, and I just want to cozy up to a bowl of this with my fuzziest blanket. Beautiful photos and I love Ramen, I've really started to get addicted to Japanese food lately and this, to be honest, isn't helping haha - Love it! Great advice for choosing and preparing green tea. I normally stay away from green tea and stick with black or herbal. With your tips I'll give it a try and make the Ramen Bowl. Looks like a perfect luncheon dish. What a beautiful bowl. I’ve never thought to use tea as a broth, what a fabulous idea! All of those flavors together sound magical. This is perfect for fall. Wow, this looks absolutely gorgeous!! I'm always in the mood for ramen, but especially when there's a chill in the air like there has been in New England this weekend. The colors in this dish are just beautiful and I'm sure the flavors are amazing! I love that you used tea as the broth!! That's so smart! And I'm totally intimidated by ramen bowls, but they're SO GOOD!! I need to try this at home-- they're so pretty AND it's cold and wet outside. Perfect! I love ramen and I LOVE green tea - like I drink 10 cups a day love - so this is the best combination I can think of! I'd be eating that in a heartbeat! Your ramen egg is also on point with that soft but still firm yolk. I need to come over the next time your making a bowl of this! This is GORGEOUS. And the green tea? Genius. When I make it, can you come over and make my bowl look this good because I definitely wont be able to!! This looks like a delicious bowl of goodness. I am a sucker for noodles of ALL kinds, so you had me at RAMEN!! Love the colours, textures and flavours happening here.